This is a grand debut novel. I hope she keeps on writing although this one will be hard to top. So what can I tell you without being a spoiler? 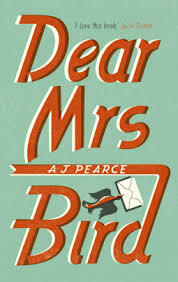 The author of The Guernsey Literary and Potato Peel Pie Society said that Dear Mrs Bird was 'funny and touching, a treat of a read'. And I agree wholeheartedly. The novel is set in London in 1940 during the Blitz. Its protagonist is Emmy Lake – who ends up working for a battle-axe agony aunt (Mrs Bird) and assisting the Fire Brigade at night. So glad to read your review of this novel as I recently added it to my ever growing reading wishlist! I like the sound of this one, off to request it from the library now.